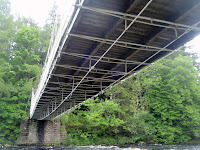 Continuing west (and upstream) along the River Dee, the next bridge is the Crathie Suspension Bridge. 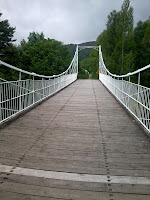 This was one of the bridges I was most keen to see on this Scottish bridge tour. I had been to it previously many years ago, but before I was aware of its significance, and I also failed to take very good photographs. It's such an interesting and significant bridge, that I'll repeat some of what I said last time I featured the bridge here. 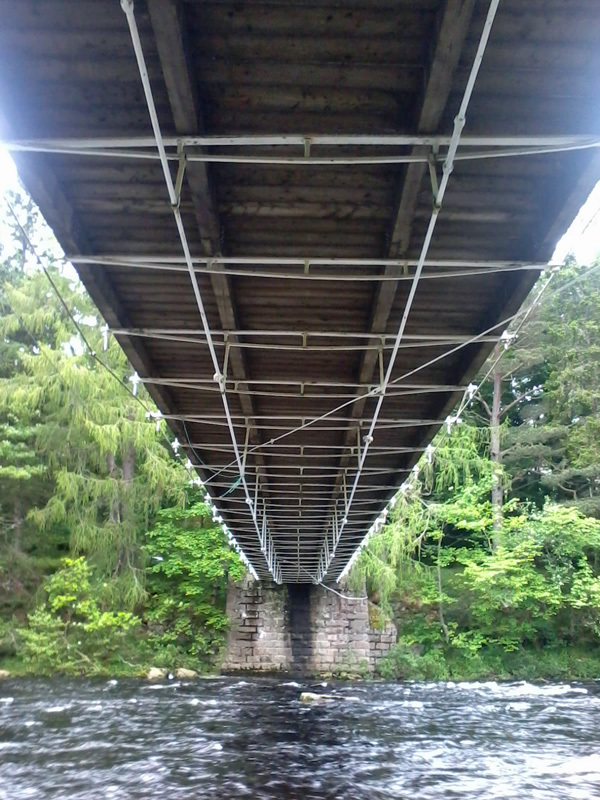 The bridge spans 42m, and it is 4.3m wide. It was built in 1834 to carry carriages, although it is now only open to foot traffic. It was designed and built by John Justice Jr, one of a family of blacksmiths from Dundee. 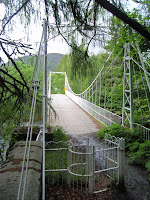 Five bridges are known to have been built by Justice, of which only three survive intact, with one derelict, and one, at Glen Clova, now gone. 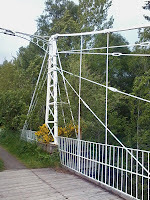 In his paper on early Scottish suspension bridges, Ted Ruddock described the structures as "vernacular bridges", which hits precisely upon what interests me about them - the ingenuity and eccentricity of bridges designed by direct experimentation rather than from the custom and habit which hamstrings many professional bridge designers. 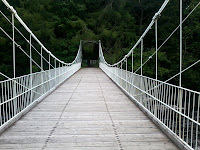 We were lucky enough to visit all four surviving Justice bridges on our trip, and they certainly are marvels. 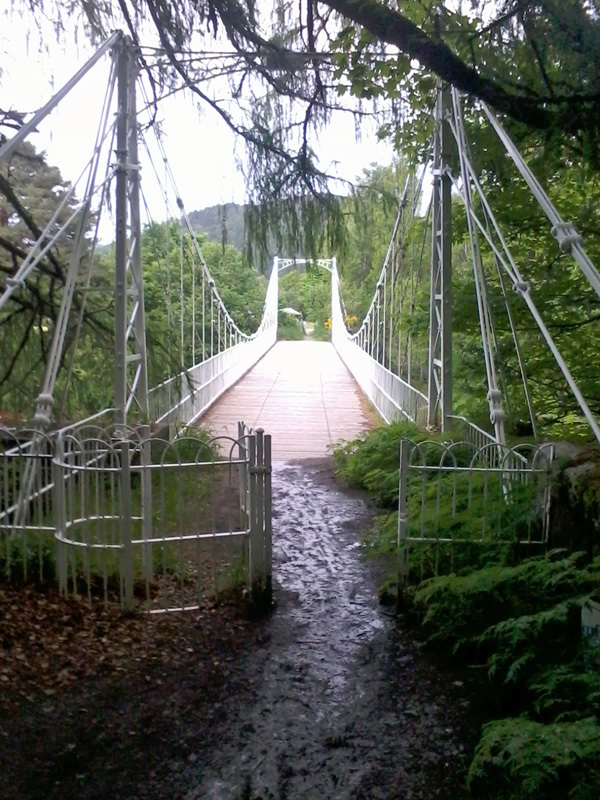 The bridge at Crathie appears to have been originally built as a "cable-stayed" structure, although it was refurbished in the mid-1880s by Blaikie Bros (the firm also responsible for the bridge at Abergeldie Castle). It's believed that was when the suspension chains were added. Along with its siblings, Crathie is one of the earliest stayed bridges to survive in the UK, and possibly in the world. It's incredible that it has lasted so well, as many early stayed designs were conspicuous failures, accounting for the form's widespread unpopularity before the mid-20th century. 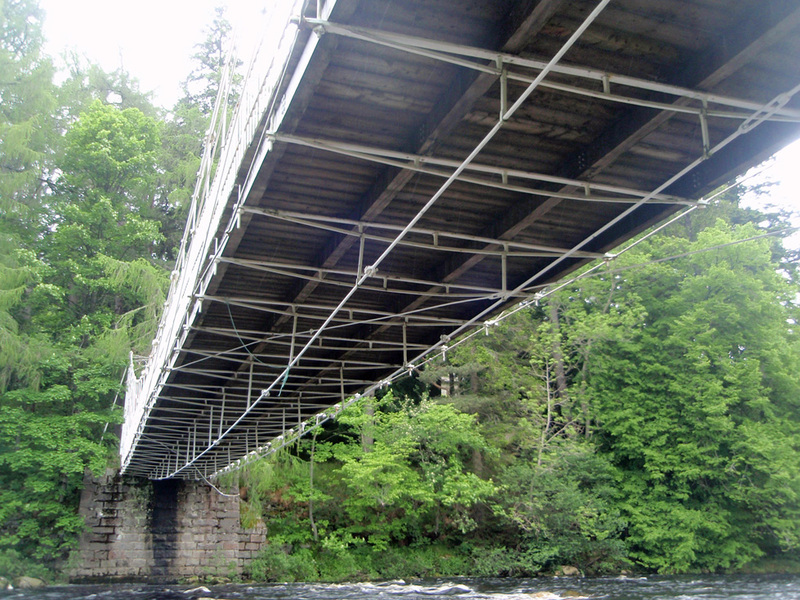 At first sight, a number of features of the Crathie bridge suggest that it might have been the work of “proper” engineers. The A-frame towers have clean, strong lines not entirely unlike the suspension footbridges of the later 19th and early 20th centuries. However, the closer you look, the more features appear that indicate a more idiosyncratic hand at work. The layout of the rod stays is one, as is the way in which the rods are connected together, with open-form “turnbuckle” connectors. 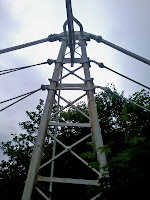 The stays in the main span form a double-fan arrangement, with two stays coming together at each of two points on the towers. From each point on the tower, only a single, larger stay continues on to the bridge anchorage. At the south end, even these two anchor stays connect together at a fork before a single rod is anchored. Perhaps the oddest feature of the stay rods is that the part of the stays which passes through the towers is curved, with the curves extending beyond their points of support. Where ties are continuously curved over their support, you would expect them to sit on a curved saddle to eliminate bending in the rod. As it is, the rods are subject to considerable bending at their upper end, which must hugely reduce their effectiveness. What's even stranger is that the same arrangement has been replicated in the later suspension chain supports. 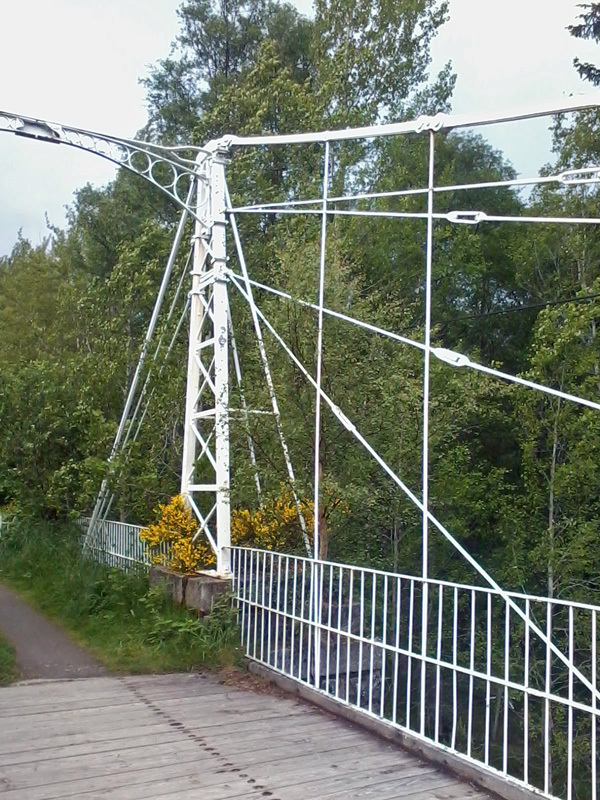 The suspension chains added during the bridge’s refurbishment are of very different form to the main stays, consisting of flat wrought iron links held together with pins in a manner not dissimilar to many other 19th century suspension bridges. It’s impossible to guess to what extent the two structural systems contribute to the bridge’s ability to bear loads – the stays are stiffer, but imperfectly engineered. Both systems are abetted by further structural elements which can only be seen from the riverbank. 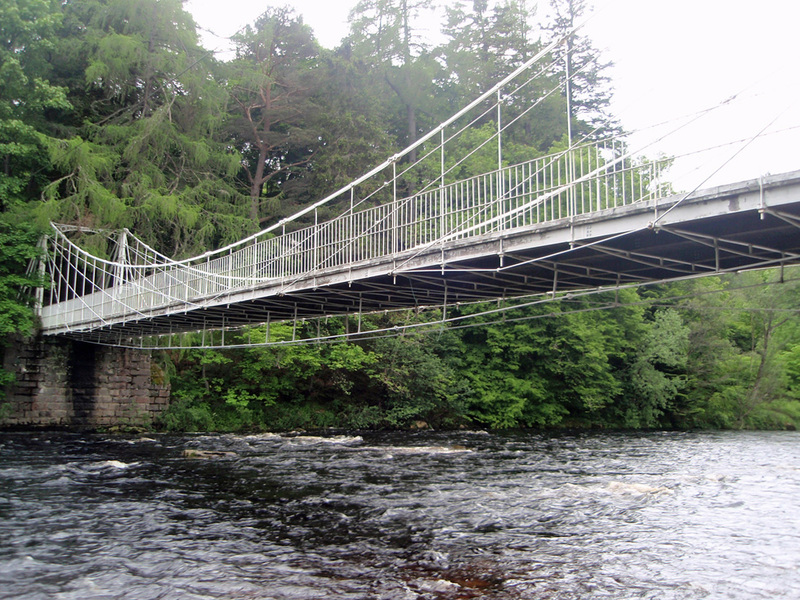 These consist of small bowstring trusses spanning transversely, as well as larger ones spanning longitudinally. Despite their lack of triangulation, these must provide vital stiffness to the structure. From below, you can also see lateral ties which run diagonally from the deck back to the abutments, on its west side (the right-hand side in the photo). I guess there may once also have been ties on the east side. 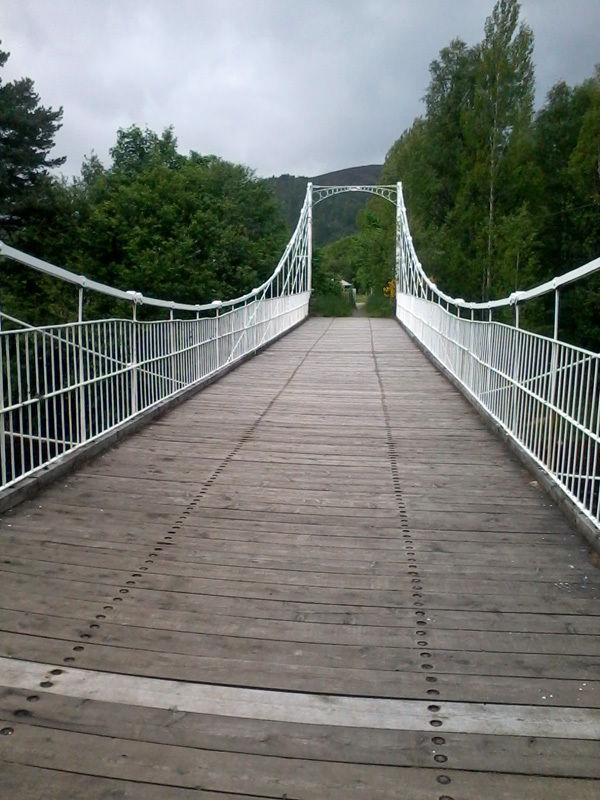 In any event, the remaining ties are now loose and no longer helping to stabilise the bridge. The profusion of structural rods, bars, and struts is not especially aesthetically pleasing, although I quite like its unembarrassed pragmatism. 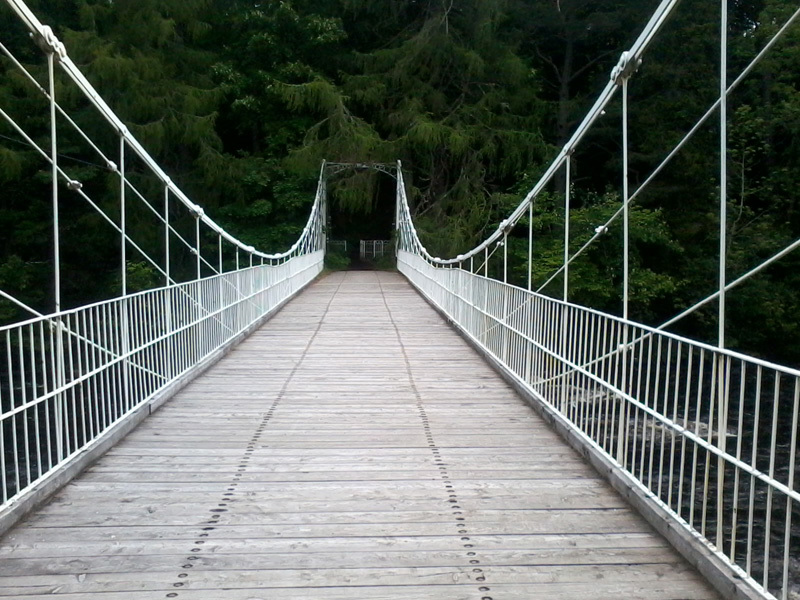 However, what I admire even more is the exceptional slenderness of all the various bridge components. 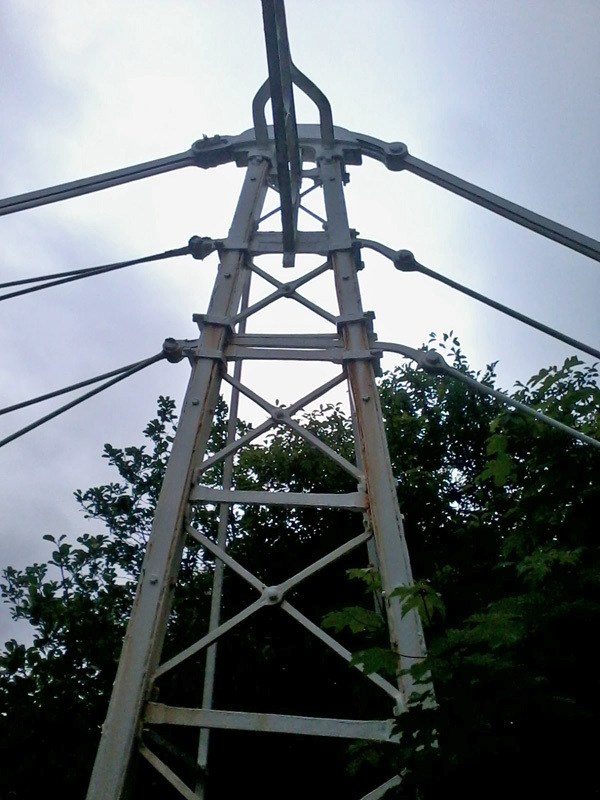 With the exception of the tower legs, there are no metal parts more than an inch or two thick anywhere on the bridge. It seemed largely immune to wobble when we crossed it. 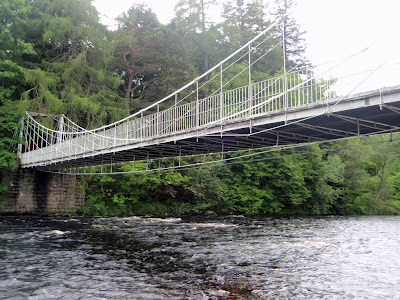 Aside from cable-net structures, it’s hard to think of a contemporary footbridge equivalent, which suggests that modern designers may still have more to learn from the past.